Healthcare organizations depend on data-driven decisions. To enable better decisions and better health outcomes, healthcare organizations are moving to the cloud. There, the latest advances in artificial intelligence, machine learning, and analytics can be more easily tested and implemented. For a healthcare organization, security and protection of data is a primary value, but solutions can be attacked from a variety of vectors such as malware, ransomware, and other exploits. The attack surface of an organization could be complex, email and web browsers are immediate targets of sophisticated hackers. One Microsoft Azure partner is devoted to protecting healthcare organizations despite the complexity of the attack surface. XentIT (ex-ent-it) leverages two other security services with deep capabilities and adds its own expertise to create a dashboard-driven security solution that lets healthcare organizations better monitor and protect all assets. Anyone in a critical health condition wants their medical professionals to be up to date. Speed matters, and making a medical decision requires all sources of information to be available as soon as possible. The inability to quickly access and process patient data due to outdated infrastructure may result in a life or death situation. The healthcare cloud security stack (HCSS) for Azure helps healthcare entities modernize the IT infrastructure, while maintaining focus on cloud security and compliance. The unified dashboard of HCSS provides a single pane of glass into the vulnerabilities identified by Qualys, the number and types of threats stopped by Trend Micro Deep Security, and intelligence for further investigation and remediation by security analysts and engineers. The unified stack eliminates the overhead of security automation and orchestration after migration to the cloud. 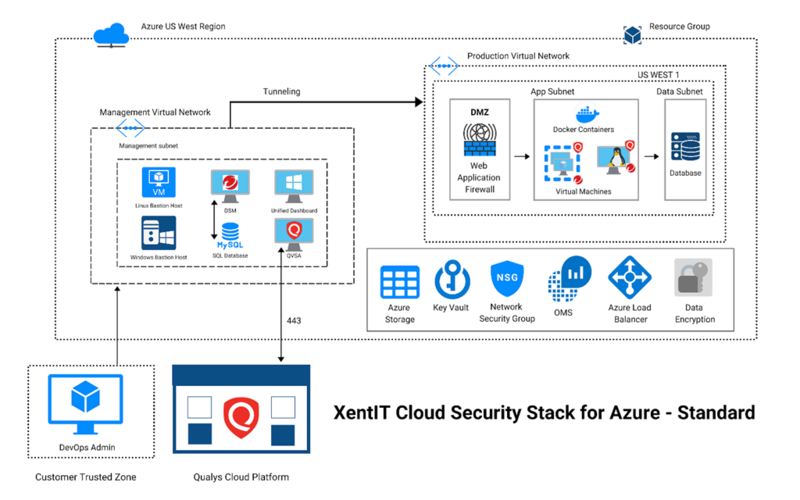 The figure below shows the architecture of a solution built on Azure with the XentIT dashboard monitoring the components, and the Qualsys service built in. Full implementation of Qualys Vulnerability Management, Cloud Agents, and Trend Micro™ Deep Security™. A unified dashboard view of security protection, tailored for healthcare organizations. Optimized for Microsoft Azure to ensure flexible, scalable protection of your operating systems, applications, and data against vulnerabilities. Detect suspicious activity, stop targeted attacks, and meet compliance from within one security console. Vulnerability Management continuously scans and identifies vulnerabilities with six sigma 99.99966 percent accuracy, protecting your Azure infrastructure. The Cloud Agent is lightweight, self-updating, and provides continuous data collection for IT security and compliance applications. The solution uses several Azure services.